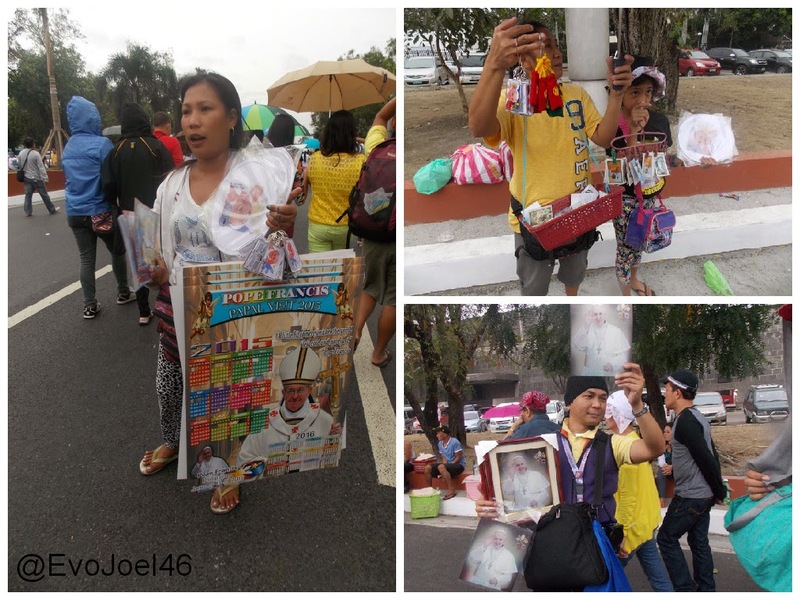 Evo & Grace: The WanderLusts: The day Pope Francis held mass in Luneta. Being a Catholic, I know in my heart that I have to make a way to see or even just a glimpse of the visiting high Priest of the Church, no other than Pope Francis who scheduled a 5 day visit in Manila and in Tacloban, of course in the Philippines last January. Along with my co-blogger friend Christian, we bravely agreeto attend the last mass of Pope Francis in Manila last January 18, 2015, it was the mass in Quirino Grandstand in Luneta. So right from my work at 9 in the morning I met Christian at MRT station, then we headed directly to Luneta and luckily we are able to get a ride via special trip by some Van operators in Taft Avenue. 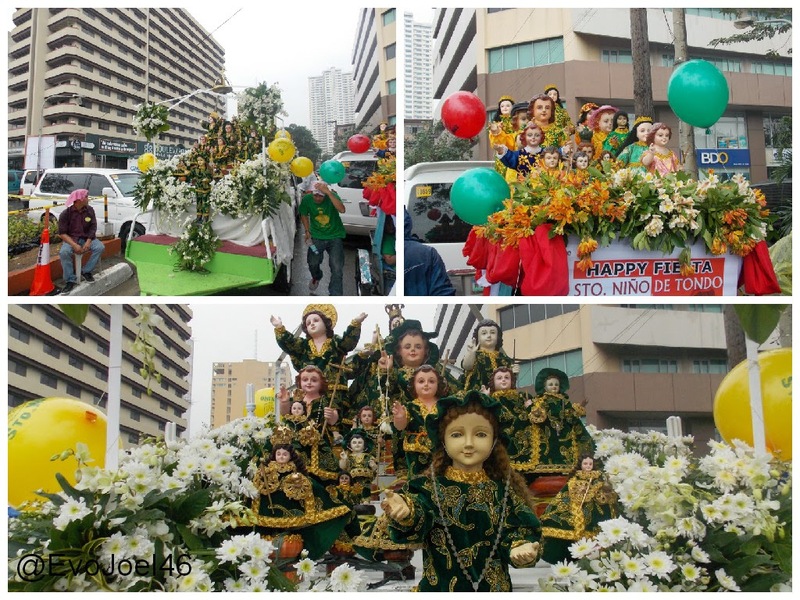 It's also Sto.Niño feast that day. Arriving in front of Cultural Center, we then walk towards going to Luneta, it seems majoritry we meet along the way are all happy, and when the rain started to fall barely before noon, we don’t have a choice but to stay somewhere not to get wet. I’m only arm with a bottle of water, we still continue the journey to Luneta even though I’m aware that it’s impossible since it’s late already. No raincoat, no umbrella, only a piece of shawl to cover my head from rain. My Shoes started to get wet inside so we look for a nearest convenience store and buy a new pair of sandals. And since we are near the Robinson Mall in Padre Faura, we venture to look for raincoat, and to our surprise it’s all sold out. 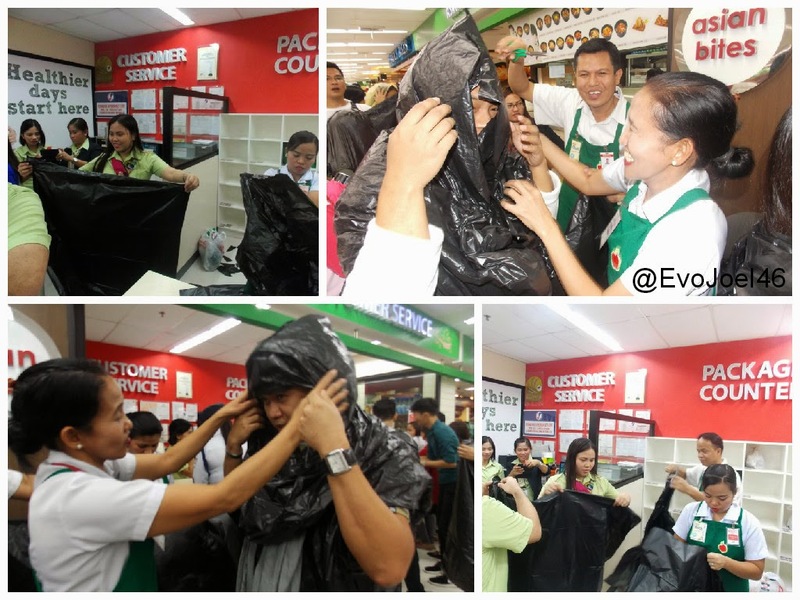 Until we saw a group of Robinson grocery people very busy doing some cut outs of trash bag, and hola we have a new improvised raincoat for the day to keep us warm. Back in Roxas Blvd, we try our very best to get into the grandstand of Quirino, but all the gates are block with people and there is no way to get near the stage, so we quit and decided to just roam around the street. Right in the road we are inform that the Pope mobile will pass, so patiently under the rain, we waited for the Pope to pass by. And yes he did, but I miss seeing his face, I was aiming my camera to get a shot of photos of him, and lately I realize he was gone like a blink of an eye. But my disappointment didn’t stop me, I know I will see the Pope again, and he will pass the same road so I convince Christian to stay longer and wait for his return. So barely after 2 hours, the Pope entourage passes the same road, this time the mobile is in slow run, I didn’t take the pictures anymore and my focus is to see him. And yes I was able to see him in close encounter, thanks to the good location we had at the center island of the street, and that moment feels like a 2 minute thing, seeing his holiness and feeling being blessed with his waive and his untiring smile. Enforcer in diaper, just a social experiment by somebody. Some group just held singing and praying at the streets. After having experience that, we call it quits and headed home. Pope Francis is the second Pope I see in person, first is Pope John Paul who is now a saint, during his visit in World Youth day celebration in 1995, where I serve as one of the animators and facilitator in one catechistical site. Thank you Pope Francis, for mercy and compassion.